Today we’re going to try something a little different. For those of you who have previously tuned in to the show, you know I’m typically interviewing world-class thought leaders ($1B+ RIAs, elite entrepreneurs, bestselling authors, and more) on distilling their expert advice and the methodologies that led to their success. But I’ve recently started to get a lot of requests asking about the concepts and strategies we use to help independent financial advisors get to that next level. So, I’ve decided it was time to roll out an “in-between-isode.” Essentially, a solo session with just me on the mic, delivering actionable tactics that you—the financial advisor—can immediately implement. Ok, so where exactly should we start? Well, over the years, we’ve dealt with a lot of offices, usually bringing anywhere from $3M to $150M+ in assets per year. No matter what the size of the firm, the most common question I get time after time, remains the same. In fact, I’m about to share the secret ingredient that 99% of the financial services industry is failing to add to their mix—even billion dollar asset managers don’t always get this right. It’s the exact same thing that’s preventing YOU from differentiating yourself from every other advisory firm on the block! I’m going to use one of my favorite examples—the most successful pitch in Shark Tank history—to demonstrate what you absolutely NEED to be doing differently. [04:58] What the company behind the #1 best selling product in Shark Tank history did differently and why this is the biggest key to your success as a financial advisor. [10:10] Discover the proprietary process that will set your firm apart, so you don’t become a commodity like the rest of the industry! [16:39] Does your financial plan look like the kitchen junk drawer? Learn how to organize the chaos and create ONE simple solution to solve all your clients problems! [20:18] The simple framework we help our clients create to break their emotional attachment to individual products or asset managers and lay out a easy to understand “retirement blueprint” for their prospects and clients. We have 3 seats remaining for our live event featuring Bo Eason, David Bach, and Derek, Keith, and Matt sharing exactly how they’ve used their proprietary process to capture $120M+ of assets this year. Click here to apply. We’re covering flight, hotel, and event tuition for those who qualify. [00:00:03] Welcome to this episode of the Elite Advisor Blueprint Podcast with your host Brad Johnson. Brad’s the VP of Advisor Development at Advisors Excel, the largest independent insurance brokerage company in the US. He’s also a regular contributor to Investment News, The Wall Street Journal and other industry publications. [00:00:24] Brad: Hi everyone. Welcome to the Elite Advisor Blueprint Podcast. I’m Brad Johnson and yes, this week you’ll notice no formal intro. The purpose of this show, this is my first ever in-between-isode is to give you guys some insight into some of the top things our top clients are doing. I will get into that the rest of the show here. The reason I wanted to put a quick intro on this episode is we do have our very last live event of the year November 5th through 7th and it directly correlates to what I speak about in this episode talking about the power of having a process versus offering products to your clients. It is a quick turnaround, November 5th through 7th. The show is going live here mid October. The reason that I wanted to go ahead and give you an opportunity, this will be our last event of the year. We rarely do them and I just want to give you guys the opportunity. You’ve been my loyal listeners that really got my show up and off the ground. We’ll have some special guests coming in. We’ll have Bo Eason. For those that aren’t familiar, former NFL football player also did a one man Broadway show. He’s taught our advisors over the last two years how to tell their personal story, how to greater connect with their audience and that’s what it’s all about in financial services as we all know. So Bo will be here training you exactly how to do that. David Bach, nine time New York Times best seller, author of Automatic Millionaire and the smart couple series will be here as well. He’ll be talking about how to scale your team, how to scale your assets under management. He spent some time with Ric Edelman and helped take them to $16 billion of assets under management or advisement. He’s going to dig in deep there and lastly we’ll have two of our top clients both offices have scale they will capture organically over $120 million of assets this year. In fact Joe one of the advisors here will capture north of $200 million this year. [00:02:25] Brad: One of the largest producers in the country. They are going open up their play book, tell you how they mark it, how they hire their team and most importantly you’ll hear a reference in this conversation how they walk their prospective clients through their process and how they are different and how they are not a commodity in their own market place. Anyway guys, wanted to do a quick intro to offer that to you as a special thank you for helping me get the show off the ground. We’ve made it really easy so it’s BradleyJohnson.com/33 or the show notes. We put the application right at the top there. It will take you less than five minutes and if you just want to skip that, don’t even want to get to the show notes you can also go directly to bradleyjonson.com/apply. That’s it. I hope a few out there, I’d love to meet you in person. We’ll be hosting it at our headquarters. So if the dates work, November 5th through 7th, check out the application. I will be reading those personally and giving you a call to let you know where to take it from here. That’s it guys. Enjoy the episode. Welcome to this episode of the Elite Advisor Blueprint Podcast. Brad Johnson here. This is my first ever run at an in-between-isode. So if I completely butcher this it’s a horrible episode, this could be my first and last but hey, we’re giving it a run. Many of you have listened to my interview version. I’ve had all kinds of thought leaders, billion plus dollar RIAs, investment managers on, really distilling their top thoughts and advice and I’ve actually had some recent request here to dig in. Obviously we consult financial advisors and opinion financial advisors and so I’m getting pinged with, “Hey, what are some of the concepts and things that you’re seeing help them get to the next level?” This is the one that I wanted to start with and please guys I would love feedback on these. If you are out there listening hit me up on Twitter @Brad_Johnson. Let me know, “Hey, that one resonated with me. [00:04:28] Brad: I’ve ran into that too or even hey this will be a great topic for a future conversation.” Here’s where I’m at. A lot of conversations over the last decade or so dealing with offices bringing in $150 million plus of assets per year and this isn’t buying practices, this is actually going out and organically growing and marketing all the way to some offices that might capture three, five, ten million dollars of assets a year. Large scale there but the consistent theme is always how should I market. In financial services the number one question I get every single time is how do I get more appointments on the calendar? We’ve spent a lot of time. We’ve helped a lot of our clients do that but here’s where I want to start today. I want to start with this hidden, unknown thing that most financial advisors even billion dollar asset managers get wrong consistently that I see over and over. I’m going to share with you today. I think it’s actually the step that comes before marketing. Now, I’m breaking some rules here. Marketing is very, very important. I don’t want to downplay that. But this is the step that actually comes before marketing. First I want to just tell a little bit of a story here. In financial services you see this over and over. You see a lot of public speaking, whether your marketing funnels are seminars, dinner events, maybe they are referral events, wine tastings, client bring a friend events, often times we also see radio. So traditional radio hour long show, clients call in to set appointments. Some of our top clients are on TV so half hour, hour long show where the call to action is when you come in and sit down with us. If you think about it, I’m going to go to a show, hopefully all of you are familiar with, I’m going to put this in the show notes, that’s a show called Shark Tank. Pretty much everybody on this earth is familiar with Shark Tank but here’s what I’ve seen which is a big take away and something that makes you scratch your head as a financial advisor. I’m going to use the case study of the number one best selling product in the history of Shark Tank and it’s this little silly sponge, I wish I had one here, I’d hold it up. [00:06:34] Brad: It’s this little silly sponge. It’s about as big as your hand and I think originally it came in bright yellow bright orange. It’s called a Scrub Daddy. I’m going to put the actual original pitch off of Shark Tank the YouTube video down below I’m going to challenge you to watch it. There’s a few lessons you can take from this. Number one, in the history of Shark Tank has there ever been somebody pitching their product or service that has come in and just described it. They didn’t actually have an example, they didn’t have the Scrub Daddy there in their hand, they just came in and said, “Here’s my product. It’s amazing. I really think you should check it out.” What would the sharks do? What would Mr. Wonderful do if right out of the gates you’re just describing your product? You don’t even have an example. What do they actually do after their five to ten minute pitch? They actually take their product and show them samples of it. Show the Sharks samples. Whatever it maybe, food, scrub daddy, some even app. They’ve got an app within a screen and technology app. They always have it on the screen and they demo it. That’s take number one. I’m going to even dig in a little bit more on the Scrub Daddy one because there’s a huge lesson there for financial advisors. So number one he shows the product. Number two, he demonstrates the product. He goes over to a sink and in that sink is a bunch of old nasty, you remember them from your childhood days, the little yellow and green sponges. They are all nasty and then he’s got also steel wool, Brillo pads, just a pile of like 100 of them all piled up in there. His pitch is, “This, the Scrub Daddy which he holds up replaces all of that.” So what did he just do for the audience? I simplified your life. No longer do you have to have 15 different things to clean all of your kitchen stuff, just one this one thing. Then he demonstrates if you run it under hot water it gets soft and it’s just like a sponge, all these green and yellow things that you can throw out now. [00:08:35] Brad: If you run it under cold water, it becomes hard like a brick, like scrubbing utensils just like these Brillo pads and the steel wool. All of that is in this. Oh and by the way, this little cute smiley face that you just thought was there for looks, and he grabs a spoon like a serving spoon and he puts that in the mouth of the sponge, it actually cleans both sides at the same time. Then he takes the two little eye holes, he puts his fingers in them, takes like a big bear mug, a glass that you can see through, puts the Scrub Daddy down in there and can twist it and turn it now because his finger is right there in the sponge. So number one demonstrates the product. Number two, the big take away on the most successful product in the history of Shark Tank is it simplifies your life. So how does this apply to financial services? Let’s go ahead and figure out what that typically looks like. Now, over a decade of consulting financial advisors I’ve been fortunate enough, I’ve seen a lot of this first hand. I’ve flown out to their live events, their dinner seminars, their dinner workshops, I’ve sat in the back of the room, I’ve just observed. Here’s what typically happens. Number one, there is no product. I’m going to stop there and let you absorb that for a second. There’s products, there’s just isn’t a product. You might be talking about the latest greatest variable annuity, indexed annuity. You might be talking about an asset manager. You might be talking about some sort of a reet or alternative investment. There’s multiple products often times presented. There’s not a product. What you’ll find though if you walk into a room, and you’re presenting a product it’s you have now turned yourself into a commodity. I’m going to repeat that. If you present product, if you present any other thing, that any other financial advisor of the hundreds of thousands in the United States of America can present you are now a commodity. What we’ve coached our top advisors to do, in fact what we actually do the back end on is helping them name their proprietary process. So now rather than saying, “Hey, I offer these annuities, I offer these managed assets, speaking generically, retirement income planning, asset management our advisors are saying things like, one of the things that we found over the last 25 years… Let’s just say I’m a financial advisor, I’m opening my presentation. “One of the things I found in the 25 plus years of financial planning is I’ve seen a lot of stories. I’ve seen a lot of good stories play out, I’ve seen some sad stories play out. What we’ve really done is we’ve distilled that down to five key areas that really when done properly and making sure these five worlds work together it helps our clients focus on the things that really matter in retirement. Things like seeing your grandkids. So if they are not here with you, we want to make sure your written plan for success and retirement has an income stream built right into it to make sure you can take that annual trip right across the country to see your grandkids. I know for a lot of you, I’m an avid traveler, one of those bucket list items maybe it’s going to see the Vatican over in Rome. We want to make sure that we’ve got a plan in place that helps you check off those bucket list items and helps you spend with confidence with the big key being regardless of the economy. [00:12:30] Brad: We want you to have confidence in any economy whether it’s the bull market like we’ve seen here in the little last eight to ten years or a bear market like a lot of us experienced in 2008/2009. All of that comes to having a cohesive plan. We’ve identified five key areas that when addressed properly, when customized and personalized to your individual scenario help keep you on the path where you want to go. Tonight we are going to talk about that.” The biggest key, I’ll step out of character now. This is a proprietary process. Look at this podcast. The Elite Advisor Blueprint, trademarked. What did I do? I went out to the national trademark database. If you Google Tess, and I searched. If you search the Elite Advisor Blueprint, my name will pop up. It’s trademarked. I’ve staked my territory, I’ve claimed my spot, whatever you want to call it. This is now my process. It’s our coaching process. It’s my podcast. It will be an upcoming book. Yes, I’m saying that publicly to hold myself accountable. We’ve seen some of this. We’ve seen groups out there that literally that say, here’s our top three products we’re offering. Rule number one, when you do that you now commoditized yourself. Okay, I’m just being real. I’m just being direct based on what we see out there in the real world. Here’s the big take away from this. 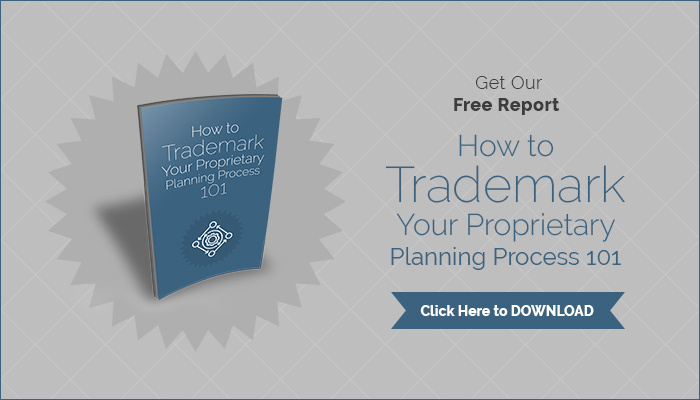 How can I name and trademark a proprietary process that sets me apart from the rest of my market place and make sure I’m no longer a commodity? The Elite Advisor Blueprint, that’s me. The retirement blueprint. [00:14:33] Brad: Obviously you’ll have to go out and search for that and make sure that whatever name you claim is your own but now if I walk in and I’m holding up a binder that basically says, “Hey we’ve identified there are five key areas and in our retirement XYZ Blueprint we cover these five proprietary worlds. Tonight I’m going to share with you why that matters. I’m going to tell a few stories along the way. Like I said, we’ve seen a few stories play out, we’ve seen some beautiful stories play out over the 25 plus years that I’ve been doing this. Unfortunately I’ve seen some sad stories. We’re going to share a couple of those too. But the biggest take away for you is going to be how can you make sure you’re covered with your own individual plan and making sure you have that in place? All of that will tie into why we do this, our proprietary five step planning process and why that came to be by us seeing this over the last 25 plus years.” Now, process over product. I’ve had a couple of guests on. They hammered it home, we’ll put them in the show notes. Dan Sullivan, strategic coach. He’s been coaching this probably before I was born. I think in the 70s when he started strategic coach. You’ll notice anything strategic coach related, it’s always got a name to it. He even has a name for naming things. The unique naming guy. That’s actually one of my client shared that with me years ago, Jeff thank you. Shout out. But that was how this name of this podcast came to be. Name your process. It’s process versus product. That’s the biggest key to step number one. Going back, I know I’m covering a lot here but on the Scrub Daddy, what’s your Scrub Daddy? You’re walking in, this is our proprietary process. Now, your potential clients whether it’s on the radio, whether it’s in that live event they know here’s the end game. Here’s what I get when I go in and meet with Brad and we talk about my issues and concerns with retirement and how I can address them and what plan will be in place to get sure I’m in a good spot. [00:16:30] Brad: Really all you’re selling is comfort. How can you provide comfort? We’ve been here before. We’ve helped other retirees just like you get where you want to go. Okay, step number two. Going back to the Scrub Daddy presentation. When he’s presenting that in the sink. He’s showing all the stuff, this mess, this chaos and he’s saying, “This simple thing fixes it all.” So one solution for multiple problems. Same thing with your process. The biggest thing I see in financial services we have the curse of knowledge. You’ve been doing this for 10, 20, 30, 40, I’ve seen people 50+ years they’ve been in financial services. So we’ve go acronyms. We’ve got jargon we’re speaking straight over the prospects heads. So the biggest key is how do we simplify the complex. Stealing that from, Tony Robbins. Seriously? Your prospects are confused. They don’t even know how to sign up if they want to. They don’t know what problem you’re solving. They are not sure if they need retirement income analysis. They are not sure if they need risk and fee analysis. You’re throwing these at them because you have the curse of knowledge. So if you think about it this way, going back to the Scrub Daddy analogy. I know it’s a simple one but I’m going to use it. One product, gets rid of all of that mess. [00:18:30] Brad: If you can drive that home in your events, in your radio show. We’ve got the solution, it’s going to be okay. Same thing. Now, when you’re talking about retirement income analysis, I have our five worlds that we’ve uncovered if you address these five key areas throughout retirement we’ve found it helps you sleep well at night. It helps you worry about the things that really matter when it comes to retirement like your grandkids, like traveling, like hanging with family, like hobbies and the beautiful thing about this and we’ve seen a lot of clients, they come in the first time, this is what their financial world looks like. Picture your kitchen junk drawer. Think of it. Everyone has got one. You open that thing up you’re looking for a paper clip, you’ve got rubber bands, super glue, the pliers that you couldn’t find last time you were looking for him, screw drivers, erasers, pens, pencils. All of this is in there. The one thing you can’t find is what you’re looking for. Unfortunately we see a lot of our clients, the first time prospects or people come in to visit with us the first time. That’s kind of a good analogy for what their financial world looks like. They have got these different products, statements, different RAs, 401K they forgot to move their financial world kind of looks like they are kicking into junk drawer. If there’s one thing that our clients love that we do for them, we bring clarity to their financial world and their financial plan. We make sure that they have a written plan for success. What we found was this five key areas. We’re just taking that kitchen junk drawer, we’re sorting through it and we’re helping them organize the chaos. So really world number one, we talk about an income plan. We’re going to make sure if there’s products you picked up along the way things like annuities or income producing bonds, things like that that have been in that world number one income producing assets we as an independent advisor, we’ve got zero psychological attachment to anything. So if you picture us, we’re like the general contractor that you hired to build your home. [00:20:31] Brad: We just open up the tool box and we say what problem are we trying to solve? Are we going to saw this board in half? Well, we’re obviously not going to grab a hammer, we’re going to grab a saw. Are we going to nail these two boards together? We’re going to grab the hammer. What unfortunately we see in financial services a lot are people that are emotionally attached to tools. It would be as if you hand me the board and said, “Brad saw this in half. Oh wait, you have to use a hammer because I hate saws. Make sure you do that with a hammer.” You would think I was insane. Unfortunately we see a lot of that in financial services. An emotional attachment to the individual tools rather than what’s the problem we’re trying to solve. Let’s rummage through all the tools here and see which one most efficiently fixes the problem. That’s the way we approach putting together our financial plans and so going back to the five worlds that kitchen junk drawer, what our clients we find that they love is when they walk out of our office they have got a binder just like this, all five key areas of their world addressed. Their anxiety is gone. They have got a written plan, a road map to get them from A to B and know that we are monitoring it all along the way to help them get there. That kitchen junk draw our goal is to take that, tab it out, here’s world one, here’s world two, here’s world three, here’s world four, here’s world five. You’re all set. We don’t do it all at once but we systematically walk through that process. Okay, so I’ve thrown a lot at you here. I don’t even see a timer yet. I know I’ve been going for a bit but just as a recap here. So process not product. Biggest key to success in financial services. One of my favorite stories I’ve got some great clients out on the East Coast. Derek, Keith and Matt. They did a great job with this. When I first met them, I think it was in 2012, 2013 they were like most financial advisors. They were like a lot of you I’m sure. They were great guys, they were hard workers and really, they were running around like crazy, selling things. Granted, they were doing what they thought was in the best interest for their clients but it was more of us finding the best products and sell the products. [00:22:44] Brad: Over the last handful of years we’ve really helped them systematically name their process, put that into place and what we found for them this year 2017 they will gather north of $120 million of assets. Granted. They’ve dialed up the marketing, they’ve built the team, there’s a lot of other things that go along with that but here’s the biggest takeaway. When they transition from selling a process, not a product their average clientele skyrocketed. Today Keith, Matt and Derek, don’t sit down typically with someone that has less than a million dollars of investable assets. Number two, I know a big goal for a lot of you offices as you scale and you try to build this thing out. How do I replicate myself? I don’t want to do double the number of appointments every year to try to double the revenue to the firm so how do you replicate yourself? How do you train other advisors to do what you do? It’s a trains for a trust. For your prospects if there is no clear defined process, if it’s I meet with Brad or with Joe and those are two different guys running their own deal, almost impossible to scale. Look at every large RIA in the country out there. They scale based on the process and the biggest thing to think about here is on this you can’t scale your process if you don’t have one. Going back to Derek, Keith and Matt, one of the things that they’ve done, there’s a guy named Joe in their office. He’ll gather $15 million of business this year as a 25 year old kid that’s pretty much fresh out of college. How did they train him? They trained him on their process. So now when he sits down with a prospect who is probably 25, 30 years younger than, and he says, “Yeah we have a proprietary process here at the firm. If you just think about that guys, that is how you scale. I’ve yet to find anybody that’s scaled at a higher level without a process and that’s just done it based on selling products. So I wanted to share that with you today. I’ve been meaning to get this out for quite a while. Haven’t had to sit down but we’ll cut it off there and we’ll get into on the next in-between-isode if you guys like these, we’ll dig in and I’ll love to hear your feedback where to take these from there. So process versus product, and we’ll leave it at that. Hopefully this was helpful to you. Thanks for tuning in. Thanks for listening to this episode of the Elite Advisor Blueprint. For access to show notes, transcripts and exclusive content from our show’s guests visit bradleyjohnson.com. And before you go, I’ve got a quick favor to ask. If you’re liking the podcast you can help support the show by leaving your rating and review on iTunes. Not only do we read every single comment, but this will help the show rank and get discovered by new listeners. It really does help. Thanks again for joining and be sure to tune in next week for another episode. [00:26:19]: Then information and opinions contained in here are provided by third parties and have been obtained by sources believed to be reliable but accuracy and completeness cannot be guaranteed by Advisors Excel. The guest speaker is not affiliated with or sponsored by Advisors Excel. For financial professional use only. Not to be sued with the general public or on a sale situation. Please keep in mind, your process should reflect the products and services you are licensed to provide, all consumers should be encouraged to seek the advice of qualified professionals for tax, legal or investment advice you/your firm is not licensed to provide.